An ex-con's first act of freedom is moving to Miami where he restarts his old criminal ways with even more potency. Not having seen what appears to have been a television movie, we decided to take a look, based on the interesting cast working here. In fact, these are actors that were on their way to becoming stars in their own right. 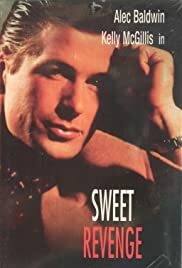 "Sweet Revenge" is a film that is typical of what was shown on television at the time. This drama, directed by David Greene, has some interesting points, but one could see from the start where it's going, so it doesn't hold any surprises when the climax arrives. Kevin Dobson, wearing several obvious wigs, plays the heavy Joseph Cheever, a man who was going places, but makes a tragic mistake in his life. Kelly McGillis was good as the sister of the man that is made the scapegoat of the crime. Alec Balwdin, Alfre Woodard, Helen Hunt, Richard Bradford, are seen in minor roles. While one can figure the drama, "Sweet Revenge" is easy on the eyes.